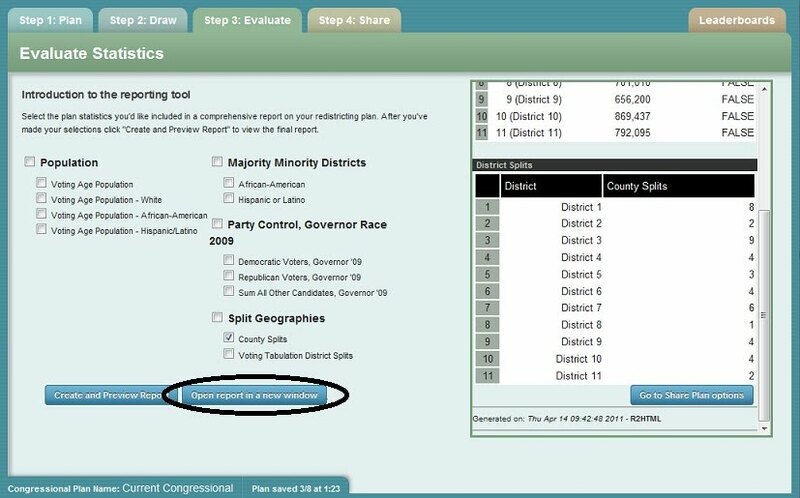 The Step 3: Evaluate tab allows you to generate a statistics report for the currently selected map. The BARD engine, written in the R statistical programming language, is the District Builder evaluation engine. BARD is an approved R module that can be automatically installed in that software and the source code is available on Source Forge. R is a commonly used freeware open-source program. If we are not reporting something that you would like to see reported, we welcome contributions to the BARD open-source project. When first entering the Step 3: Evaluate tab, you will be presented with a number of check boxes associated with various available statistics that the software will generate for you. The available statistics and their behavior are set by the software administrator. Typically, these statistics will include the following information, which is included in the database underlying the software. We describe these data and their significance for creating legal redistricting plans in more detail here. Population. By default, all reports include the total number of persons within each district. Additional statistics may be selected for voting-age population by race and ethnicity, which are important to consider when drawing districts that comply with the Voting Rights Act. Please note that compliance with the Voting Rights Act is a complicated legal question. We can only provide statistics on the minority populations. We cannot assess other important legal considerations, such as the effective level of minority population needed to elect a minority candidate of choice. Majority Minority Districts. 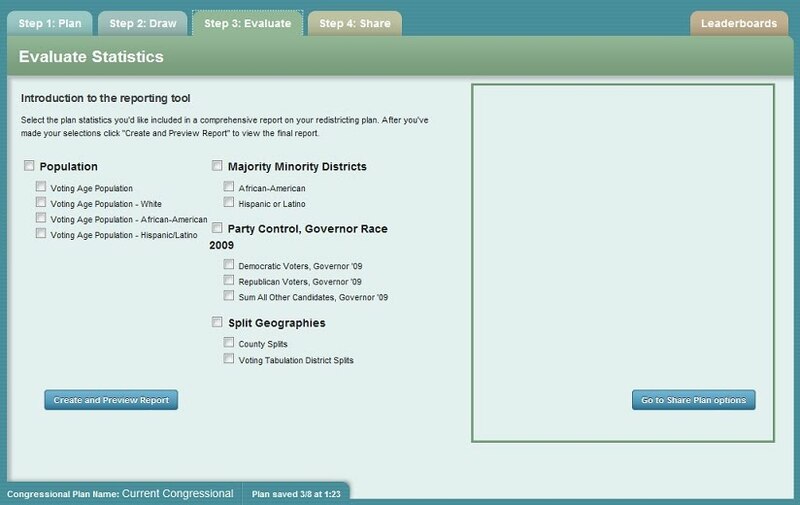 To further, and quickly, determine how well your plan conforms to minority representation goals, reports on whether or not a particular district is a majority minority voting-age population district are available. Political Data. In the example given above, counts for the number of votes for the Democrat, Republican, and sum of minor party candidates in a governor's race are provided. More (or no) electoral contests may be available, depending on the database constructed for a state. Split Geographies. These reports count the number of geographies split by each district. If a district entirely contains a geography -- such as a county -- then there are zero splits of that county. A count of split geographies are generated for each district. For example, if there are two districts in a county, then each will have one split for that county. Totaling across all districts provides a count of all splits. You may wish to think about this statistic in terms of the number of splits of each geography, rather than the number of geographies in each district. This counting method has a property such that if a geography is split, then the number of splits of that geography will equal the number of districts contained within it. If a geography has only one district, there will be zero splits. Thus, a geography can never have one split by this counting method. The administrator may choose to make additional statistics available. Once you have selected the statistics you wish to generate for your report, click the "Create and Preview Report" button. Reports are computationally intensive, so they may take a while, especially if there are a large number of users drawing maps. For this reason, please use the evaluation reports sparingly. You will see the message "Please wait while your report is created. This will take a few minutes." while the software calculates the requested statistics. You may not take other actions until the software finishes creating your report. Once your report is complete, you have two choices how to view these statistics. The statistics will appear on the right hand window pane. You can use the scroll bar to scroll through the report statistics. A new "Open report in a new window" button will appear. Clicking on this button will open the statistics in the window pane in a new browser window. Tip: you can copy and paste these statistics into a program such as Excel by selecting the statistics you wish to copy, using the browser copy function, and pasting into the other software. For Excel, we have discovered that the statistics will be nicely formatted if you select "Paste Special > Unicode Text".